These versatile manipulatives make visualizing fractions a snap. 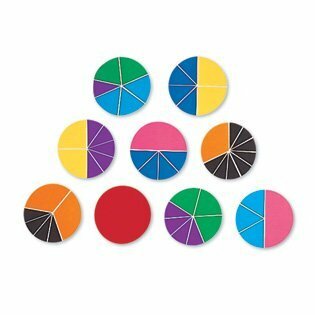 Perfect for small-group activities, the Deluxe Rainbow Fraction Circles Set comes with a dual-use work tray/storage box and includes one whole circle plus eight circles divided into halves, thirds, fourths, fifths, sixths, eighths, tenths and twelfths, plus Teaching Notes. Color-coded to correspond to all Rainbow FractionÂ® products.